JNDA 01-53. The half sen was minted non-continuously from M6 (1873) through M21 (1888). One sen is 1/100 of the yen, and the characters across the top on the reverse translate to '200 pieces in exchange for 1 yen'. The denomination has two basic style of obverse, with the earlier style having a dragon with 'squared' appearing scales. Later issues have a 'sharp' scale style with one year overlapping with both styles (year M.10/1877). The reverse features the typical double foliage wreath, tied at the bottom and with the Chrysanthemum crest at the top. 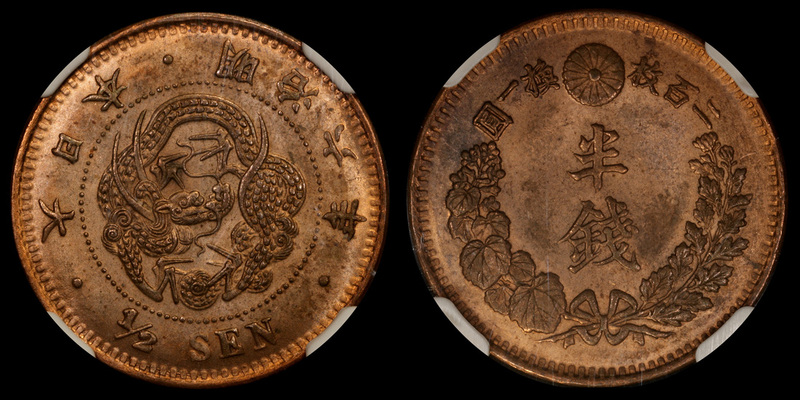 Meiji year 6 (1873) NGC MS-63RB. The 1877 'square' scaled dragon is much scarcer. 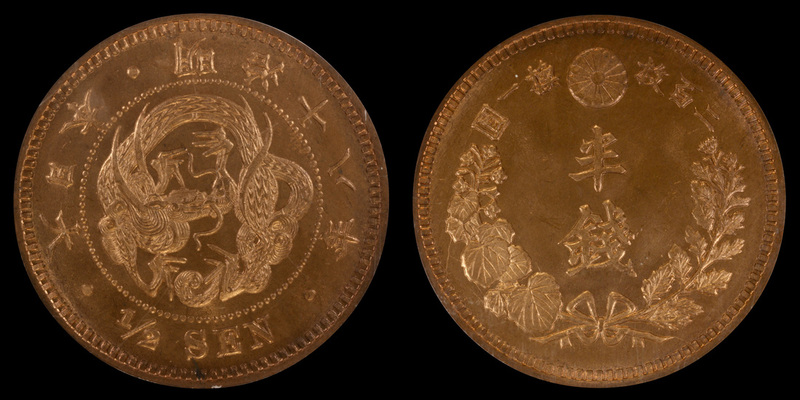 Meiji year 18 (1885), NGC-66 RB. Meiji year 7 is notable for a variant. 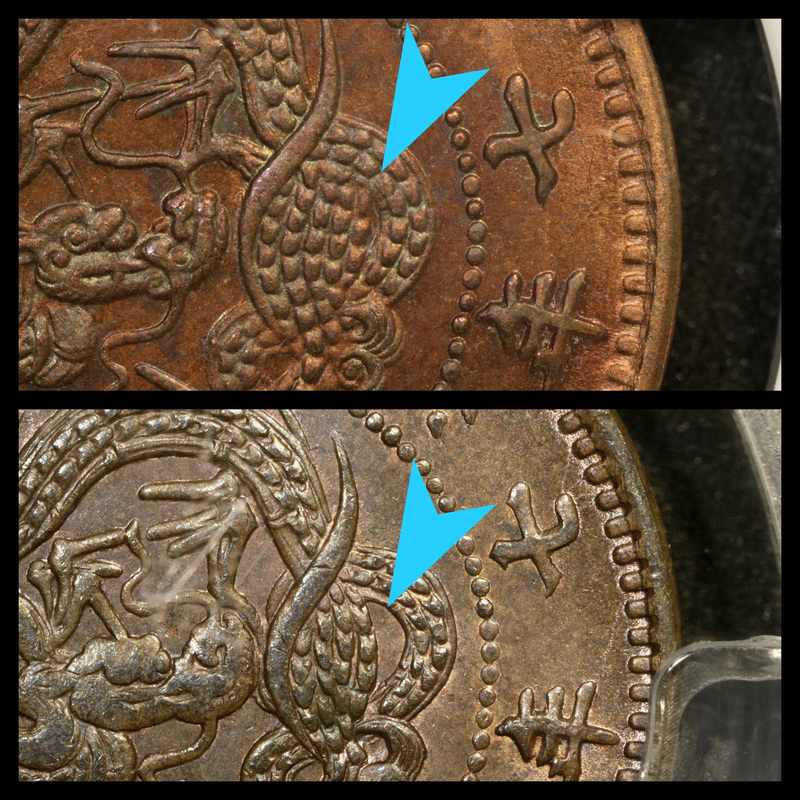 The dragon's coil is thicker on the specimen on the top, which is the 'early' version of the design (as is the year six coin above). The 'late' version has a thinner inner loop, thus a larger gap between the loops, and this is how the subsequent years' coils appear (until the change to the sharp style). The thick coil/early version is the more scarce.